Watch our video to find out more about this rug and then keep reading to see more photos and to find where to purchase the pattern for this beautiful rug. 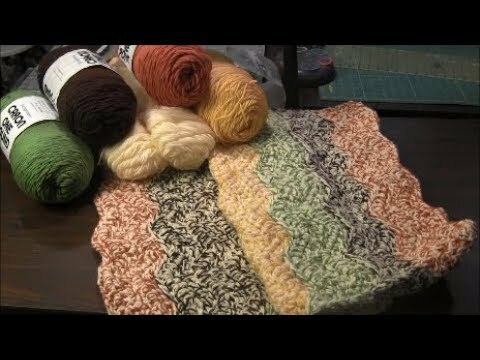 Click to watch the Crochet a Fall Colors Rug video in Youtube. The Fall Colors Rug pattern calls for using Caron One Pound Yarn in several colors: Cream, espresso, sunflower, pumpkin and grass green. I found that the one pound size is really not needed for any of the colors except possibly the cream. I didn't use a lot out of the other colors, so for those, a normal sized skein of a worsted weight yarn would probably work just fine. 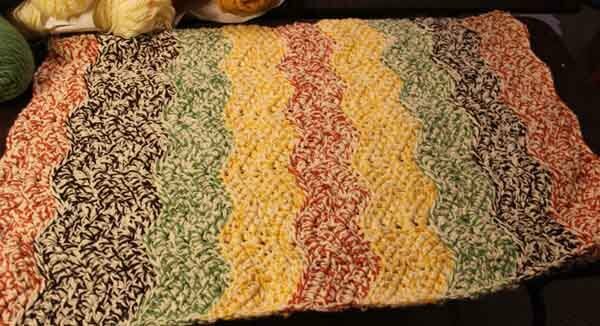 A large crochet hook is used to make this rug, size M/13/9mm. This is a really large hook, but it's needed because 3 strands (two cream and one color) of yarn are held together at once while crocheting. 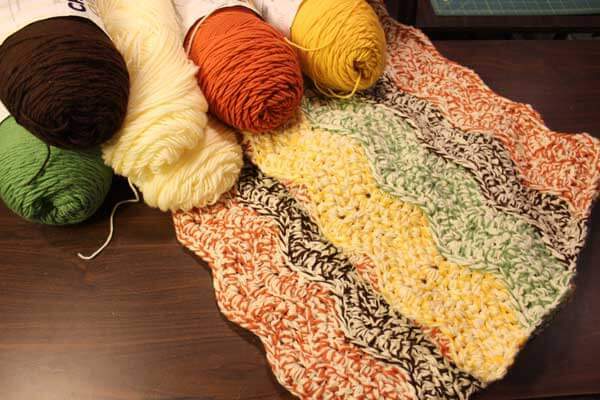 The pattern for this rug is simple and uses mostly double crochet (dc), chain (chs) and double crochet decrease over 3 stitches (dc2tog-over-3). This last stitch is more complicated but the instructions describe how to do this stitch pretty clearly. A tapestry needle is used to weave in the ends of the yarn after switching colors. Once you get the pattern memorized, it stitches up pretty quickly as it's just repeating the same over and over with the different colors. 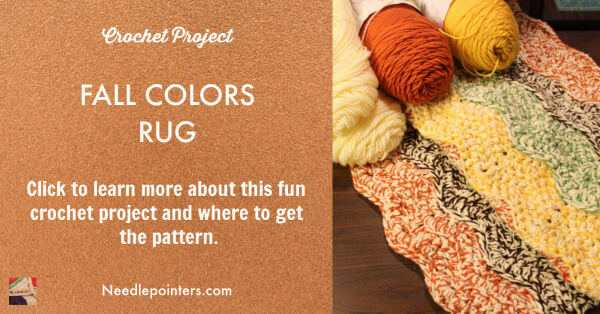 The pattern starts with pumpkin and then continues with espresso, grass green, sunflower, pumpkin which gets you to the middle of the rug. Then repeats for the other side of the rug with sunflower, grass green, espresso and finally pumpkin again. The finished size of the rug is 24 inches wide by 42 inches long. I enjoyed making this rug and may make it in other colors too!